The Eyjafjallajo kull volcano in Iceland, which started erupting on April 14th, 2010, is most famous for paralyzing international air traffic. However, concrete specialists at Iceland’s Mannvit Engineering observed that the transportation of the ash over such long distances might signify more than an impact on air travel, but also serve as an indicator of properties useful to industry. In 2009, Mannvit Engineering created an International Centre of Research and Applied Technology for Alkali Aggregate Reactions (AAR), an undesirable chemical reaction that can cause structural problems in concrete if not mitigated effectively. Researchers in the Centre identified the ash as potentially useful for mitigating AAR due to the fineness of the particles and the high content of SiO2 (approx. 60%). To test the value of the ash, engineers established accelerated tests to measure the properties of the ash and its usefulness in mitigating AAR. 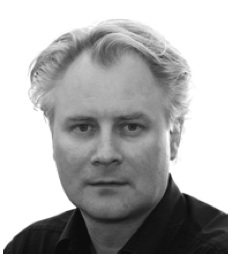 As the founder of the Centre, Børge Johannes Wigum explains, the accelerated mortar bar test provides a relatively good indication of the mitigating effects of various pozzolans and other supplementary cementious materials. In the test, mortar samples were made both without ash and with 5% replacement of the cement. After 14 days of exposure in a 1N NaOH solution at 80°C, expansion measurements of the mortar bars indicate that the ash dramatically reduces expansion due to AAR. It is well known that natural pozzolanic materials have the effect of mitigating AAR. According to Mannvit Engineering’s Concrete Scientist Karsten Iversen, the chemical composition of the ash is similar to fly ash, a well known concrete additive derived from burning coal. Other aspects of the Eyjafjallajo kull ash were examined at Mannvit's material testing laboratory, including grain size distribution (See chart) and properties of fresh and hardened mortar. Test results indicate that the volcanic ash–if feasible to quarry–may prove an attractive potential additive to concrete for the Iceland concrete industry. 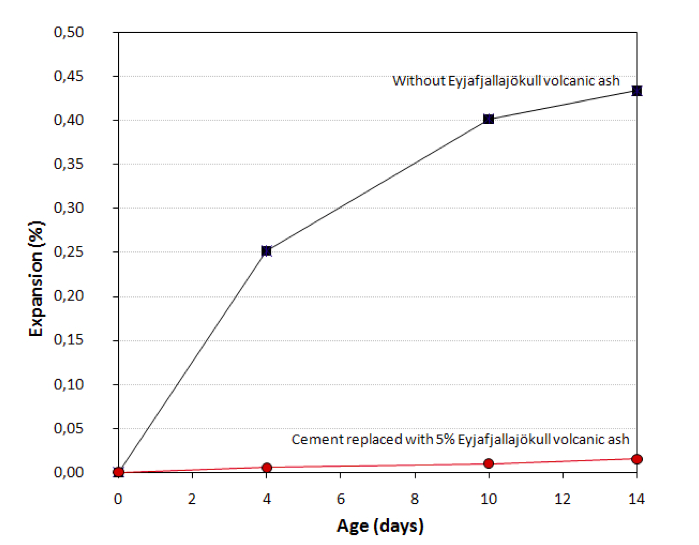 Alkali Aggregate Reactivity ‐ Measured by Accelerated Mortar Bar TestReplacing cement with 5% EyjafjallajÃ¶kull volcano ash dramatically reduces expansion due to alkali aggregate reactions. 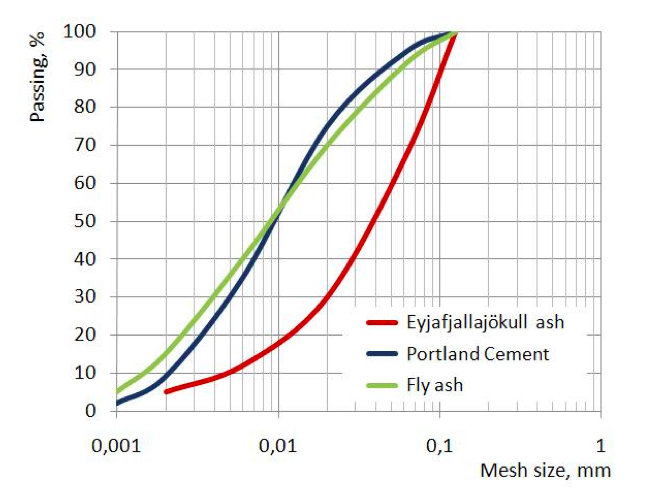 Grain size distribution of volcanic ash vs. Portland Cement and Fly AshThe chemical composition of the volcanic ash is similar to fly ash, a well known concrete additive derived from burning coal. Dr. Borge Johannes Wigum - Engineering Geologist, PhDDr. 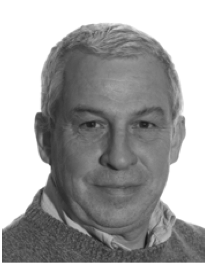 Borge Johannes Wigum, founder of the International Center for Alkali Aggregate Reactivity. Karsten Iversen - Concrete ScientistKarsten Iversen, Concrete Specialist at Mannvit Engineering.